Why Is Plenum Cable Important to High Density Data Centers? In most terrible building or house fire disasters, combustible plastics (PVC) used in the wiring are always among the very things that contribute to the rapid spread of fire and toxic smoke. And the air conditioning systems even help the toxic smoke given off by the burning cables to spread throughout the building quickly. 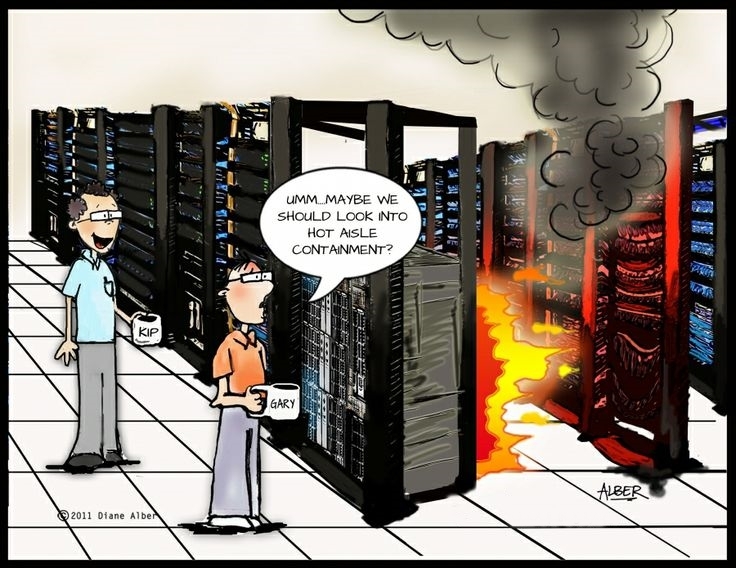 As for the high density data center with high speed computing equipment and large amount of plastic jacketed cables, it is crucial to take measures to reduce the damage in an unwanted fire. How to make the crucial data center a safer place? The high quality plenum cable (eg. MTP fiber) can be one of the best choices. The break-down of precision air conditioning system might lead to fire incident. Plenum space is an area used for return of air circulation or air conditioning systems. In a data center, the spaces covered by the precision air conditioning unit are often necessary to deploy plenum products. They include not only plenum containment that separates cold aisle and hot aisle, but also plenum cables that meet the highest fire code requirements. Both electric cables and fiber optic cables are required to be plenum rated (CMP) when they are installed in inner walls and inner ceilings of data center buildings. Cold aisle containment (left) and hot aisle containment (right) in a precision air conditioning unit. The integration of plenum jacket and MTP fiber is a perfect solution for high density data center applications. 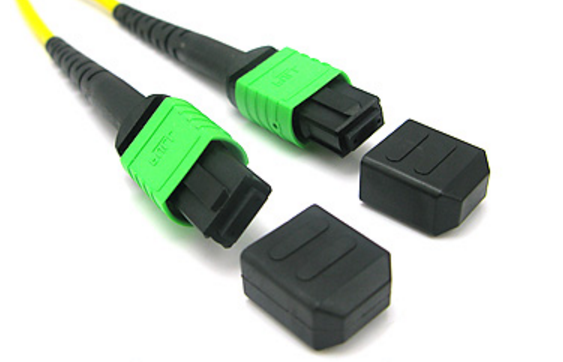 The safety feature of the plenum cable and the high fiber port count of MTP connector endow the data center with two essential components. By using MTP plenum cable, the possible danger that might be caused by cables located at cold aisle and hot aisle can be minimized when a fire incident occurs. In addition, the high bandwidth demands within a limited space in data center can be satisfied. Use MTP plenum cable to get safety and high bandwidth at the same time. When buying MTP fibers, be sure to check if it is genuine plenum rated and the MTP connector should meet the physical connection standard for acceptable insertion loss. When burnt, plenum cable will give off little smoke, and the color of the smoke is light instead of dark. FS MTP plenum cables are made of Corning fiber and U.S. Conec MTP connector. They are all tested and guaranteed by 3D interferometry and the insertion loss is no more than 0.35 dB. No matter it is the plenum jacket, the inner fiber, the connector, or the end face geometry, they are all genuine parts and in high quality. They can be checked by any user without a problem. FS high quality MTP plenum cable made of U.S. Conec connector and Corning fiber. This entry was posted in MPO/MTP solutions and tagged buy MTP plenum cable, MTP connector, MTP Fiber, MTP plenum supplier on July 14, 2017 by Serenity Huang. 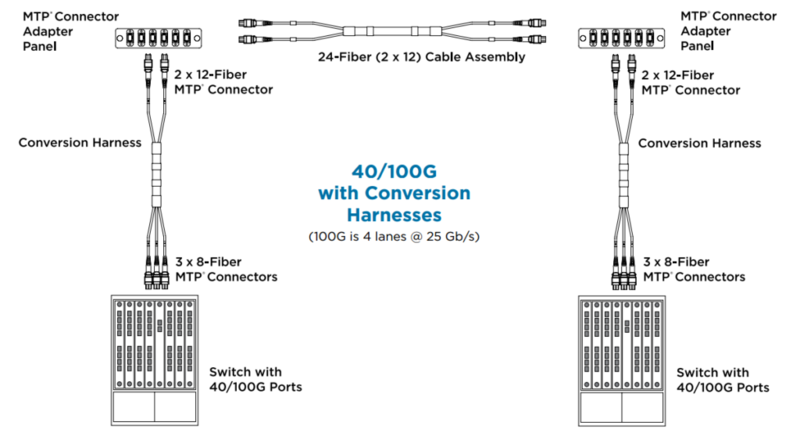 Migrating from 10G (that uses two fibers in either a SC Duplex or a LC Duplex connector) to 40G and 100G fiber will require a lot more fibers and a different type of connector. The way that optical fiber cabling is deployed for 10G can facilitate an easier migration path to 40G and 100G fiber in the future. An effective migration strategy needs to provide a smooth transition to the higher Ethernet speeds with minimum disruption and without wholesale replacement of existing cabling and connectivity components. Optical fiber cabling is commonly deployed for backbone cabling in data centers for switch to switch connections and also for horizontal cabling for switch to server and storage area network connections. The use of pre-terminated optical fiber cabling can facilitate the migration path to 40G and 100G fiber in the future. Figure below illustrates a pre-terminated cable assembly (MPO cassette) containing 24 OS2 single-mode fibers with two 12-fiber MPO connectors at both ends. This fiber cable assembly plugs into the back of a breakout cassette that splits the 24 fibers into 12 LC Duplex connectors at the front of the cassette. Four of these cassettes are mounted in a one rack unit (1U) patch panel to provide up to forty-eight 10G equipment connections using LC Duplex patch cords. The FS.COM FHD 1U fiber enclosure with four LC Duplex cassettes is illustrated in Figure below. If upgrading from 10G to 40G, one or more of the LC duplex cassette(s) can be replaced with 12 port MPO adapters. The MPO adapters are designed to fit in the same opening as the cassettes. The Figure below illustrates the case where all four cassettes are replaced with four high density 12 port MPO adapters. This solution illustrates an upgrade path from 10G to 40G that does not require any additional space and reuses the same patch panels. The 12 LC duplex cassette(s) are replaced with 12 port MPO adapter(s) as needed. Additional 24-fiber cable assemblies (or any fiber counts in multiples of 12 fibers) are provided as needed for backbone or horizontal cabling. This entry was posted in MPO/MTP solutions and tagged 100G, 100G Fiber, 1U fiber enclosure, MPO adapters, MPO Cassette on February 22, 2017 by Alice.Gui. Traditional optical cable management such as duplex patch cords and duplex connector assemblies work well in application-specific, low-port-count environments. But as port counts scale upwards and system equipment turnover accelerates, these cable managements become unmanageable and unreliable. Deploying a modular, high-density, MTP-based structured wired cabling system in the data center will significantly increase response to data center moves, adds and changes (MACs). Knowledge of MTP modules and MTP harnesses will be provided in this blog. An obvious benefit to deploying a MTP-based optical network is its flexibility to transmit both serial and parallel signals. MTP to duplex connector transition devices such as modules and harnesses are plugged into the MTP trunk assemblies for serial communication. MTP Modules are typically used in lower-portcount break-out applications such as in server cabinets. MTP harnesses provide a significant increase in cabling density and find value in high port count break-out situations such as SAN Directors (see figure below). The built-in modularity of the solution provides flexibility to easily configure and reconfigure the cabling infrastructure to meet current and future networking requirements. MTP harnesses and modules can be exchanged or completely removed from the backbone network to quickly adapt to data center MACs. MTP modules typically are placed in a housing located in the cabinet rack unit space. Here the MTP trunk cable is plugged into the back of the module. Duplex patch cords are plugged into the front of the module and routed to system equipment ports. Integrating the MTP modules cabling solution into the data center cabinet can enhance the deployment and operation of the data center cabling infrastructure. As shown in the figure below, integrating the MTP modules into the cabinet vertical manager space maximizes the rack unit space available for data center electronics. MTP modules are moved to the cabinet sides where they snap into brackets placed between the cabinet frame and side panel. Properly engineered solutions will allow MTP modules to be aligned with low-port-count system equipment placed within the cabinet rack unit space to best facilitate patch cord routing. MTP harnesses are plugged into the backbone MTP trunk assemblies through an MTP adapter panel. The MTP adapter panel is placed in a housing that is also typically located in the cabinet rack unit space. MTP to LC 12-fiber break-out harnesses plug into the front of the adapter panels and are routed over to the director line cards where the LC duplex ends are plugged into the line card ports (see figure below). These MTP harnesses are pre-engineered to a precise length with strict tolerances to minimize slack, while a small outside diameter allows for easy routing without preferential bend concerns. With a pre-engineered cabling management, not only is installation simplified, but the time required for SAN design and documentation is greatly reduced with port mapping architecture inherent to the design. 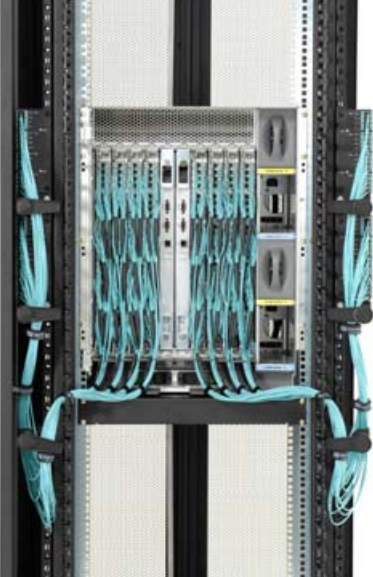 The move from the traditional low-density duplex patch cord or assembly cabling management solution to a high-density MTP module and harnesses cabling management solution integrated into the cabinet vertical manager enables the physical layer to be implemented in a manner that provides a flexible and reliable cable management in the data center. FS.COM MTP cassette provide a quick and efficient way to deploy up to 24 LC or 12 SC fiber ports in a single module. Modules are available in multimode (62.5/125 and 50/125) and single-mode cable. MTP harnesses in FS.COM are available in 8-fiber MTP to LC breakout cable, 12-fiber MTP to LC breakout cable and MTP to 24-fiber LC for your options. For more information, please feel free to contact us at sales@fs.com. This entry was posted in MPO/MTP solutions and tagged cable management, MTP modules, mtp to lc breakout cable on November 14, 2016 by Alice.Gui. With widespread deployment of 40G and 100G networks, high-density MTP/MPO cable solutions are also become more and more popular. 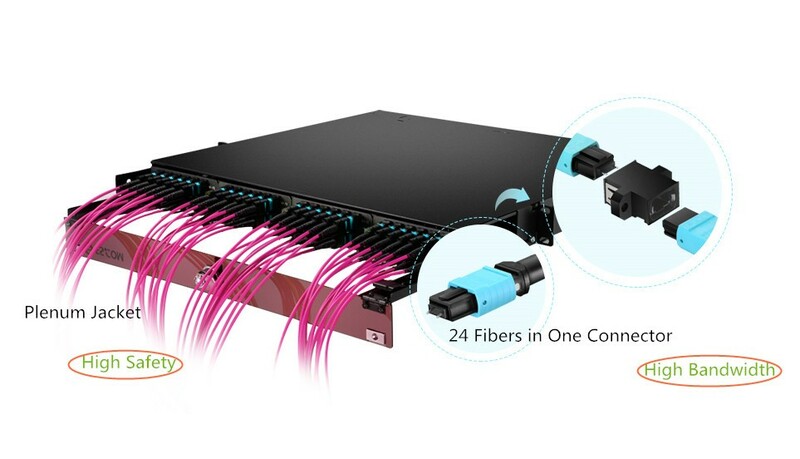 Unlike traditional 2‐fiber configurations LC or SC patch cords, with one send and one receive, 40G & 100G Ethernet implementations over multimode fibers use multiple parallel 10G connections that are aggregated. 40G uses four 10G fibers to send and four 10G fibers to receive, while 100G uses ten 10G fibers in each direction. MTP/MPO cable can hold 12 or 24 fibers in a connector, which greatly facilitates the upgrade to 40G and 100G networks. However, since there are so many fibers, the polarity management of the MTP/MPO cable may be a problem. Before explaining the polarity, it is important to learn about the structure of MTP/MPO connector first. Each MTP connector has a key on one side of the connector body. When the key sits on top, this is referred to as the key up position. 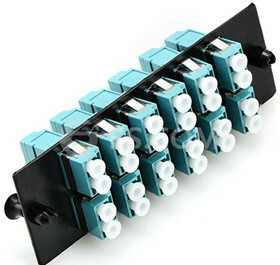 In this orientation, each of the fiber holes in the connector is numbered in sequence from left to right. We will refer to these connector holes as positions, or P1, P2, etc. Each connector is additionally marked with a white dot on the connector body to designate the position 1 side of the connector when it is plugged in. 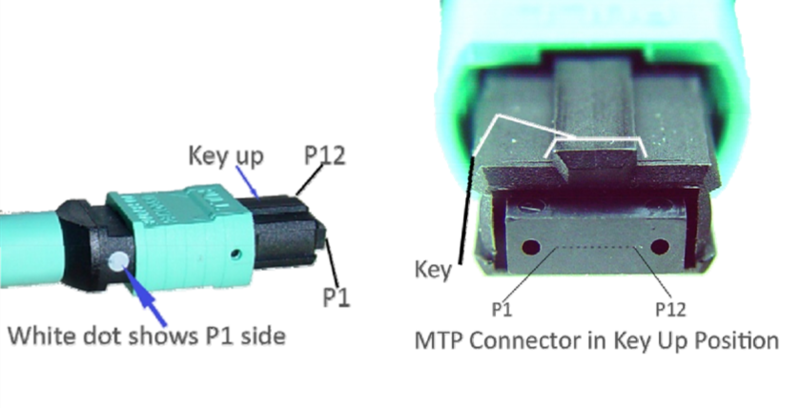 Since the MTP connectors can either key up and key down, there are two types of MPO adapters. Here the key is up on one side and down on the other. The two connectors are connected turned 180° in relation to each other. Both keys are up. The two connectors are connected while in the same position in relation to each other. Classic duplex cables are available in a cross-over version (A-to-A) or a straight-through version (A-to-B) and are terminated with LC or SC connectors. 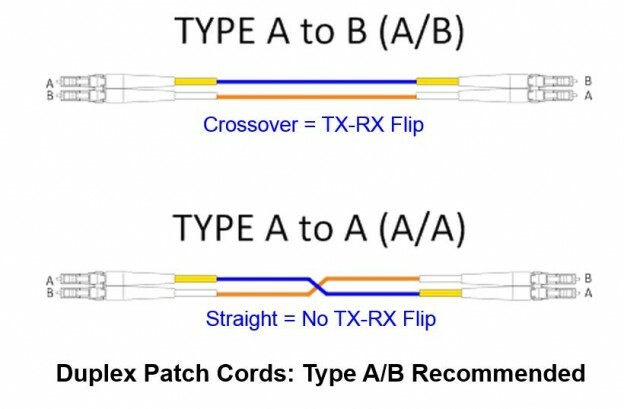 Telecommunications Cabling Standard defines the A-B polarity scenario for discrete duplex patch cords, with the premise that transmit (Tx) should always go to receive (Rx) — or “A” should always connect to “B”. Therefore, A-B polarity duplex is very common in applications. Unlike traditional duplex patch cables, there are three polarity for MTP/MPO cables: polarity A, polarity B and polarity C.
Polarity A MTP cables use a key up, key down design. Therefore, as shown in the figure below, the position 1 of one connector is corresponding to the position 1 of another connector. There is no polarity flip. Therefore, when we use polarity A MTP cable for connection, we must use A-B duplex patch cables on one end and A-A duplex patch cables on the other end. Since in this link, Rx1 must connect to Tx1. If we don’t use A-A duplex patch cable, according to the design principle of polarity A MTP cable, fiber 1 may transmit to fiber 1, that is to say Rx1 may transmit to Rx1, which may cause errors. Polarity B MTP cables use a key up, key up design. Therefore, as shown in the figure below, the position 1 of one connector is corresponding to the position 12 of another connector. Therefore, when we use polarity B MTP cable for connection, we should use a A-B duplex patch cables on both ends. Since the key up to key up design help to flip the polarity, which makes fiber 1 transmit to fiber 12, that is the Rx1 transmits to Tx1. Like the polarity A MTP cables, polarity C MTP cables also use a key up, key down design. 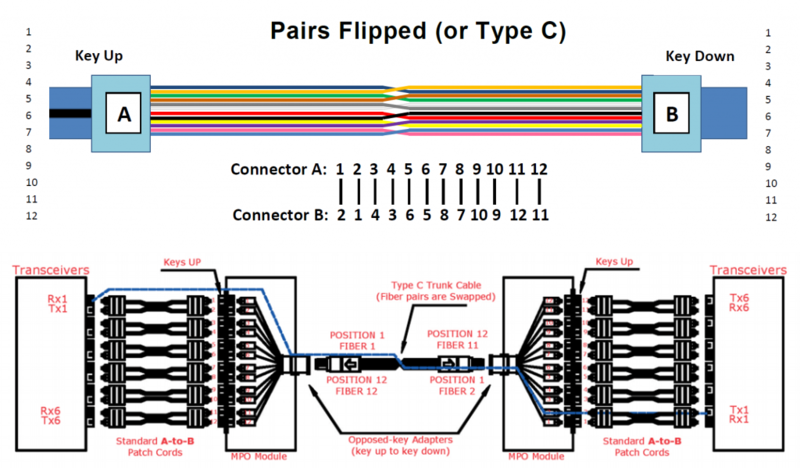 However, within in the cable, there is a fiber cross design, which makes the position 1 of one connector is corresponding to the position 2 of another connector. As shown in the figure below, when we use polarity C MTP cable for connection, we should use a A-B duplex patch cables on both ends. Since the cross fiber design help to flip the polarity, which makes fiber 1 transmit to fiber 2, that is the Rx1 transmits to Tx1. 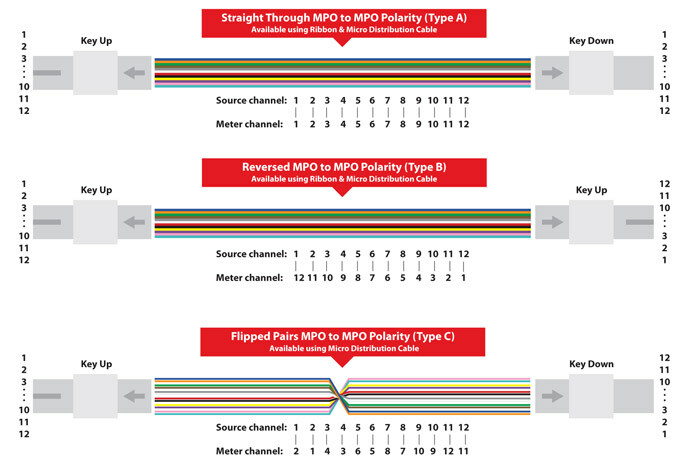 Different polarity MTP cables may have different connection methods. No matter which type cable you choose, remember its design principle and choose the right cabling infrastructure for your network. FS.COM provides a full range of MTP cables and MTP cassettes, polarity A, B and C are all available. This entry was posted in MPO/MTP solutions and tagged MTP cassettes, MTP/MPO cable, polarity A MTP cable, polarity B MTP cable, polarity C MTP cable on August 5, 2016 by Alice.Gui. As we know, harness cables are generally used to connect high-density switches with LC serial transceivers installed. The transition harness connects to the pre-installed MTP backbone trunk cable and then furcates to LC connectors entering the switch. This kind of MTP-LC harness cables are usually supplied in short lengths because they are normally only used for “in-rack” connections. Transition harnesses are available for Base-8, 12 and 24 backbones and the LC tails are numbered for clear port identification and traceability. Another harness cable type is conversion harness cables, which allow users to convert their existing MTP backbone cables to an MTP type which matches their active equipment. Conversion harnesses are a low-loss alternative to conversion modules because they eliminate one mated MTP pair across the link. Many of today’s legacy infrastructures are built using a Base-12 MTP backbone design, however experience shows us that this connector is rarely used on higher data rate switches or servers. Currently Base-8 is the preferred connector for 40G (SR4) transceivers and Base-24 is the preferred connector for 100G transceivers (SR10). The final type of harness cable is MTP trunk harness cables. MTP trunk harness cables are high density multi-stranded cables which form the backbone of the data center. This kind of trunk harness cables are available in different fiber-counts up to 144 fibers, which reduce the installation time by consolidating multiple sub-units into a single cable. This approach significantly reduces the overall diameter of the cable and provides much better space utilization of cable routing channels. Just as two types harness cables mentioned, the MTP trunk harness cables are also available with 8, 12 and 24 fiber sub-units so that users can deploy Base-8, Base-12 or Base-24 infrastructures to suit their MTP connectivity requirements. This entry was posted in MPO/MTP solutions and tagged data center, Harness Cables, MTP on July 19, 2016 by Alice.Gui. How to Ensure MTP/MPO Polarity of the Patch Cable Is Always Right? As we know, in order to ensure the right MTP/MPO polarity, transmit signal (Tx) at one end of the cable must match the corresponding receiver (Rx) at the other end of the cable. In some complex cabling deployment, it seems not much simple. Now this article may give you some golden rules to help you ensure the right MTP/MPO polarity of Patch Cables. When fiber optic patch cables have different polarity (for example, MTP or MPO polarity), we must to be very careful when replacing patch cables in our network. If you don’t understand polarity and use the wrong polarity patch cables, it may influence the transmission the damage your device. To decrease this risk, we recommend that you’d better use the same patch cables in your network. Two types of duplex fiber patch cord are defined in the TIA standard: A-to-A (cross-over) type and A-to-B (straight-through) type. Note: A-to-A patch cords are not commonly deployed and should be used only when necessary as part of a polarity method (See ANSI/TIA-568-C.0). The three methods for proper polarity defined by TIA 568 standard are named as Method A, Method B and Method C. To match these standards, three type of MPO trunk cables with different structures named Type A, Type B and Type C are being used for the three different connectivity methods respectively. As shown in the figure below, type A MPO cables just like the A-to-A duplex cables, Tx can’t match the Rx. Type C MPO cables use a pair flip design, which aren’t suitable for 40GBASE-SR4 and 100GBASE-SR4 standard. Therefore, we should use Type B MPO cables for connection. For MTP/MPO cables, gender is a big problem. MTP/MPO interfaces on optical transceivers are always male (pinned). To avoid damage to the optical module, MTP/MPO polarity must always be female-to-female (unpinned). Besides, there is a rule must be obeyed if we want to connect an MPO patch cable to another cable. That is a male patch cable must be connected to a female patch cable. Never connect a male to a male one or a female to a female one. All kinds of duplex patch cables and MPO patch cables are available and in stock for same-day shipping in FS.COM. For more information, you can contact us at sales@fs.com. This entry was posted in MPO/MTP solutions and tagged MPO Cables, MPO patch cable, mpo polarity, MPO Trunks, patch cable polarity on May 11, 2016 by Alice.Gui. This article will discuss different connection methods between parallel Quad Small Form-factor Pluggable (QSFP+) transceivers and Small Form-factor Pluggable (SFP+) transceivers. As we know, a 40G QSFP+ transceiver can be either an 8-fiber parallel link or a 2-fiber duplex link. In this document when QSFP is used we will be discussing an 8-fiber parallel link. A SFP+ transceiver is usually an 2-fiber duplex link. According to standard, since QSFP+ is 40G interface, SFP+ is 10G interface, therefore four SFP+ transceiver must be needed to connect to one QSFP+ transceivers to achieve 40G transmission. 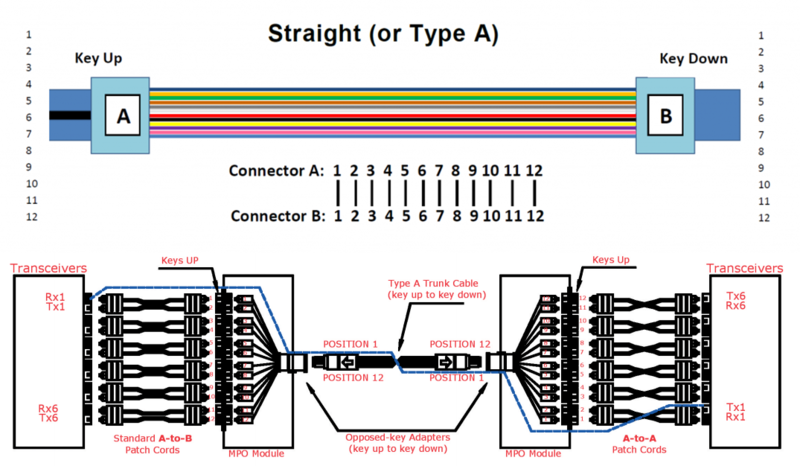 When directly connecting a QSFP port to the four corresponding SFP ports, an eight fiber MTP-LC breakout cable is required. The harness will have four LC Duplex connectors and the fibers will be paired in a specific way, assuring the proper polarity is maintained. This type of direct connectivity is only suggested for short distances within a given row or in the same rack/cabinet. The 40G QSFP+ to 10 SFP+ interconnect solution shown in figure below shows one link with a breakout of the QSFP with the use of an MTP-LC module to four SFP links. A Type-B non-pinned MTP to non-pinned MTP cable is used between the MTP-LC module and QSFP transceiver. The connection to the SFP transceivers is accomplished with Uniboot LC duplexed jumpers. This is a solution that is only recommended for short distances, where the patching takes place within a given row of racks/cabinets. This solution does present some disadvantages which are that ports 5 & 6 of the module are not being used thus reducing the patch panel density. It may also create some confusion when patching occurs since these two ports are dark. Unlike the patching approach in figure above, the solution shown in figure below has no dark fibers o r ports. The Type-B jumper is replaced with an eight-fiber harness. The modules are replaced with the LC-LC adapter panel. Using this approach allows full patch panel density that was lost in the previous example. 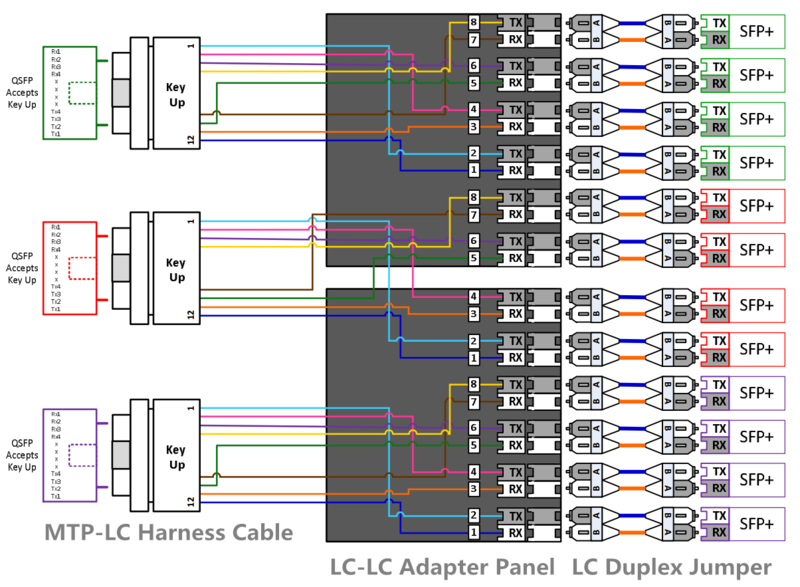 Only two LC-LC adapter panels will be required for every three 8-fiber harnesses. All ports on the LC-LC adapter panels will be used and the connections to the 10GbE ports will be completed with an Uniboot LC duplexed jumper. This solution should also be deployed when there is a short distance between active components (within the same row). Note the LC panel does not support the LC Uniboot connector, only LC Duplex connectors with the triggers removed to avoid clearance issues with the panel cover. Fiberstore (FS.COM) provide all the products mentioned above, including 10G SFP+ transceivers, 40G QSFP+ transceivers, MTP patch cables, MTP-LC harness cable, MTP-LC module and LC-LC adapter panel. All in stock and can be shipped the same day. Related article: It’s Time to Use MTP Cassettes in Your Network! This entry was posted in MPO/MTP solutions, QSFP+ Transceiver, SFP+ Transceiver and tagged 10G SFP+, 40G QSFP+, LC-LC adapter panel, MTP-LC harness cable, MTP-LC module on April 28, 2016 by Alice.Gui. Why Demand for Ultra High Density Fiber Optic Enclosures? Increased demand for data to support streaming media and the increased use of mobile broadband communications has resulted in dramatic advances in network switching infrastructure over the past 10 years. Furthermore, this demand is expected to continue at a record pace. Since the transition from copper to fiber as the standard for high-performance data communications and the number of fibers used to support emerging standards, such as 100GBit/s Ethernet, for the individual connection has increased, to choose higher density fiber optic enclosures is certainly innate. Currently, network switching products are available with port line cards that use more than 1,000 OM3 fiber and OM4 fibers per chassis switch for 10G duplex fiber applications. 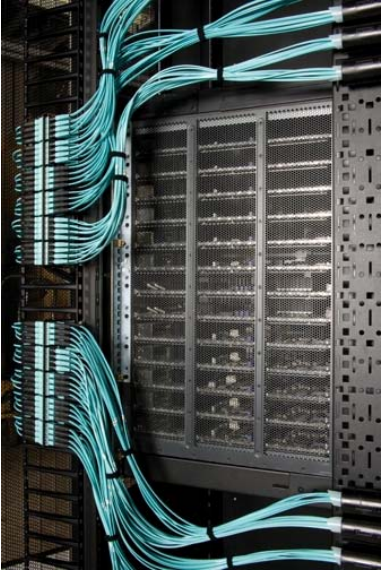 Future 40/100Gb switches are projected to use more than 4,000 fibers per chassis where parallel optics is used. These high fiber count requirements demand high-density cable and hardware solutions that will reduce the overall footprint and simplify cable management and connections to the electronics. Fiberstore’s new FMT1-4FAP-LCDX series product allows customers to migrate from a standard 2U fiber enclosure that will house 3 adapter panels for a maximum of 72 LC connectors to our new 96 ports fiber optic enclosures that will hold 4 adapter panels in a 1U space allowing a maximum of 96 LC connectors! This gives users 33% (or 24 more) more LC connections in a 1U enclosure versus a 2U enclosure. Besides, you can get more density by utilizing our MPO/MTP to LC cassette module. Our HDSM-12MTP/MPO rack mountable MTP cassette is loaded with 72 LC duplex connectors, giving it 144 ports total within 1U of rack space. And this 1U enclosures can be mounted vertically so you can match every blade in the switch to each enclosure. This high-density MTP cassette is constructed of light weight, yet durable, rolled steel. The shallow depth of the Ultra Panel makes it suitable for copper racking systems or telecommunication rack infrastructure. With the rise in demand for higher bandwidth and faster download speeds, FS.COM high-density fiber optic enclosures were designed to keep pace with these requirements. 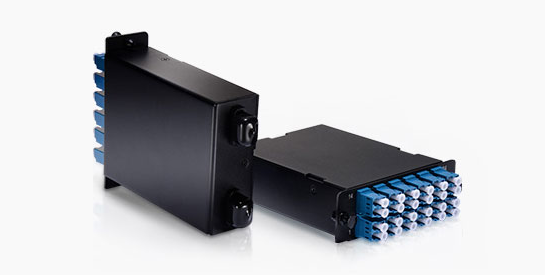 In addition, both of these unique fiber optic enclosure lines offer installers easy terminations, and performance-driven connectivity. Couple that with FS.COM’s proven fiber optic cable, in particular, our HD push-pull tab patch cables, customers can expect an exceptional solution to fit their high-density needs. This entry was posted in Fiber Optic Enclosures, MPO/MTP solutions and tagged Fiber Optic Enclosures, OM3 Fiber, OM4 Fiber on April 13, 2016 by Alice.Gui. Why Do You Need MTP Pre-Terminated Fiber Solutions? Today’s modern data center proposition continues to promote the hot topics around consolidation, reduced operating expense, flexibility, scalability and of course being as ‘Green’ as possible along the way. That sounds simple, but when you start to achieve all of the above, maybe difficult than you imagine. Recently, more and more mission critical enterprise networks are considering the need for multiple fibers in a high density, modular and pre-terminated solution. Why are they become so popular? And do you also consider this solution for your network? We have seen panel to panel links, both copper and fiber being installed for many years. These tend to be mainly in data centres, linking up racks, and therefore providing easy moves and changes within local patching fields. But, the trouble is these fibers are terminated and then fixed permanently in to place. In the past, a fiber installation would have involved a good amount of forward thinking, ensuring that the planned lengths were precise as there would be little movement to rectify any mistakes. This would result in a costly installation. Therefore, it’s clear that high speed enterprise networks are already demanding and installing multiple fibers MTP solution, meaning selecting that right easy and expandable fiber infrastructure choice from the offset is of vital importance. When it comes down to fiber it has to be the pre-terminated MTP connections, providing new advancing technologies that provide multiple fibers in a very small and modular footprint. MTP type connectors, also referred to as MPO, supplying you with a single trunk cable of either 12 or 24 cores. All in all, not much thicker than a standard fiber patch lead, so greatly reduced in size from previous pre-terminated fiber cable installations. However, already being requested are larger cores of 36, 48, 72, 96 or even 144 – but do keep in mind that these will be thicker in construction and could be made of multiple cores on a number of separate cables. Where Could Pre-Terminated MTP Solution Be Used? The MTP to MTP fiber cassettes suit various environments, applications and budgets. Primarily, data centres, DR-Co locations, FCoE SAN’s, links between floors/risers and larger communication rooms. Basically, for anyone that needs to quickly create a 10 Gigabit performance fiber network backbone. All of these demand, and would ultimately benefit, from the uncompromised performance, density and scalability that MTP solutions can provide. Additional to the MTP to MTP cassette links, we are also seeing an increased demand for ‘last metre’ fan out cables. For example, 12x LC connections to a single MTP adapter, being used for direct 40 Gigabit equipment links. With the ever increasing need for more bandwidth and virtualisation of application 40Gbp’s speeds are already being installed in data centers. How Does It All Stack Up? Supplied as part of the MTP solution is a 1U rack mountable fiber enclosure, so the installation is extremely easy. Each 1U enclosure will hold 3 cassettes and at the back of each cassette you can then access the MTP trunk cable male socket(s). The more cassettes you purchase the more 1U trays are supplied. You will then find at the front of multimode or single-mode cassettes are the legacy LC fiber connections, in either a 6 or 12 duplex (12 or 24 Core), to link back to the active network hardware or existing patch panels. Minimal time is required for the installation, with no need for onsite fiber termination and better still no out of hours working, allowing you to experience the highest performance from your network. If you would like any further information around our easy and expandable MTP fiber solution then please do get in touch with us at sales@fs.com or visit our website at www.fs.com. Thanks for reading and I hope this article has been a useful introduction to MTP pre-terminated fiber solution. This entry was posted in MPO/MTP solutions and tagged fiber enclosure, MTP Cassette, MTP connection, MTP Pre-Terminated on April 8, 2016 by Alice.Gui. As we all know, the standard specifies MPO as a connector to the 40GBASE-SR4/CSR4 QSFP+ transceiver. 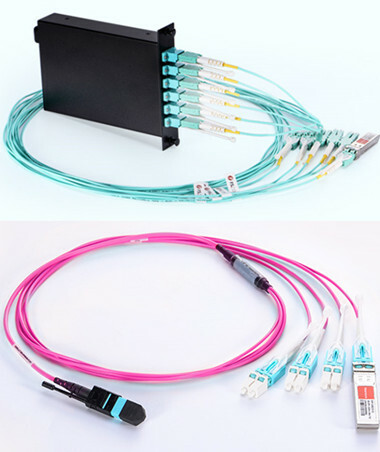 To connect a QSFP+ to QSFP+, we usually use a MTP 12-fiber trunk cable. In the 40GBASE-SR transmission, there are eight fibers associated with the channel—four fibers for the TX signal and four fibers for the RX signal. Therefore only 8 of the 12 fibers are used, where the remaining four are not used, and can optionally be not present in the cable. So we can also choose a MTP 8-fiber trunk cable for connectivity. This article explains 40G QSFP+ SR4/CSR4 transceiver to 40G QSFP+ SR4/CSR4 transceiver cabling selections. How to Choose Right MTP Trunk Cables? 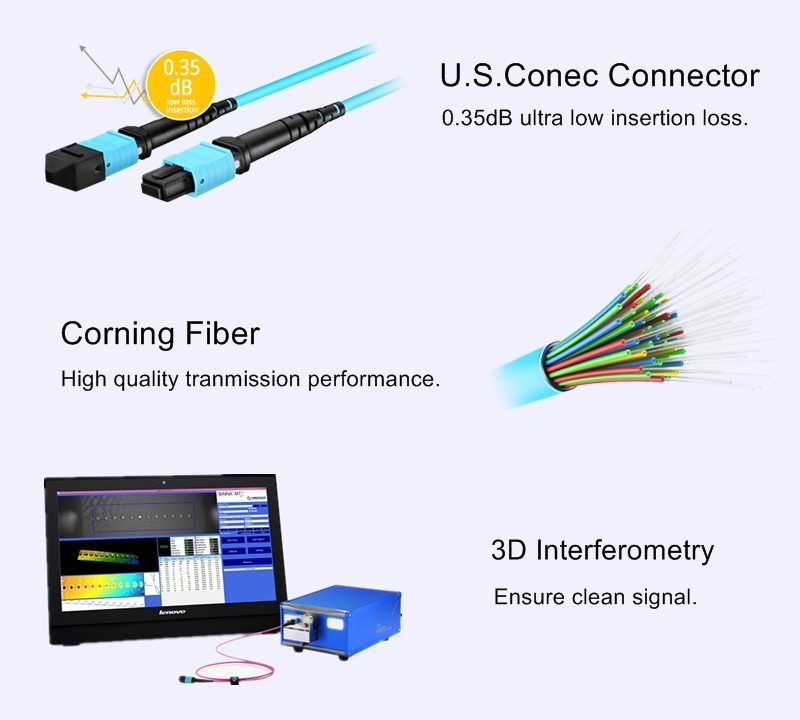 In addition to using a MTP 8-fiber trunk cable or MTP 12-fiber trunk cable, there are a number of other factors also needed to be considered when to choose a right MTP trunk cable for 40G QSFP+ SR4/CSR4 transceiver connectivity. Use single-mode or multimode MTP trunk cable? In the market, both single-mode and multiode MTP trunk cable are available. Which one should I use? According to 40GBASE-SR4 standards, 40G QSFP+ SR4 transceiver supports link lengths of 100 meters and 150 meters, respectively, on laser-optimized OM3 and OM4 multimode fibers. Therefore, to connect a 40G QSFP+ SR4 to 40G QSFP+ SR4, we should choose OM3 or OM4 multimode MTP trunk cables. 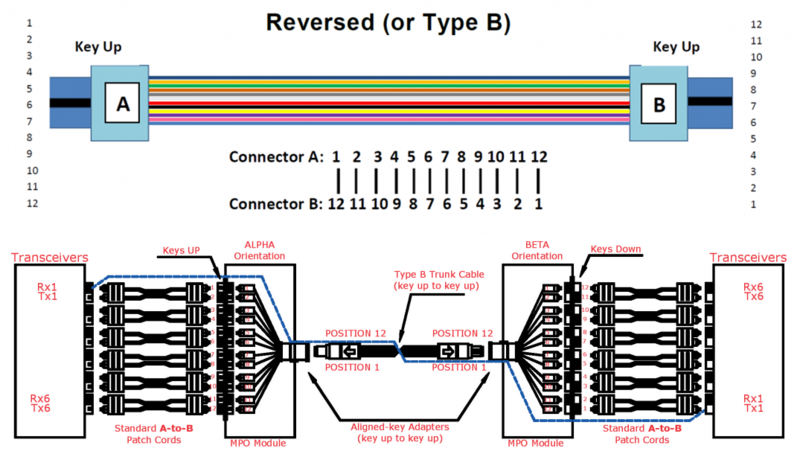 MTP trunk cable polarity selection: A, B or C? In terms of MTP trunk cable, there are three kinds of polarity options (A, B and C). Which one to choose? In fact, according to the IEEE 40GBASE-SR4 specifications, we must select a type B MTP 8-fiber or MTP 12-fiber trunk cable. The type B trunk cable has opposing connectors with both keys oriented facing up, however the fiber positions are reversed at each end i.e. the fiber at position 1 at one end is connected to position 12 in the connector at the opposing end. Choose male or female MTP trunk cable? In terms of a MPO connector, it is divided into male and female types. They ensure that the adapter holds the connector with the correct ends aligned with each other. A MPO trunk cable usually has two MPO connector on each side. Therefore, MTP trunk cables are available in male–male and female–female two versions. 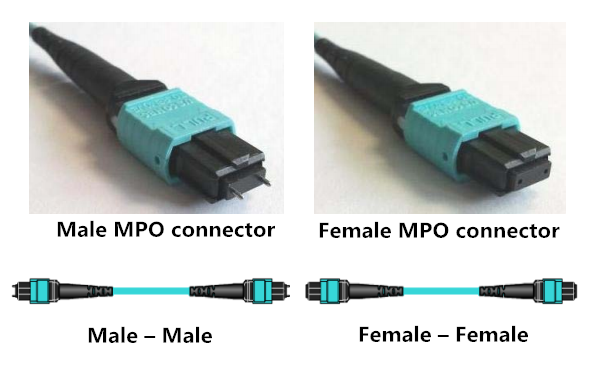 According to IEEE standards, MPO optics in a 40G QSFP+ SR4 transceiver are always male connectors, and therefore will always accept female MPO connectors. So if we want to connect a 40G QSFP+ SR4 transceiver to a 40G QSFP+ SR4 transceiver successfully, we must choose a female–female MTP trunk cable. In order to satisfy different cabling requirement, we may choose different cabling methods. And different cabling methods call for many different cabling infrastructure. Following are four type common cabling methods to connect a 40GBASE-SR4/CSR4 QSFP+ to 40GBASE-SR4/CSR4 QSFP+. When directly connecting one QSFP+ MPO/MTP interface transceiver to another, a Type-B female MPO/MTP to female MPO/MTP cable is required. This type of direct connectivity is only suggested for short distances within a given row of racks/cabinets. Following picture shows two QSFP+ transceivers being connected with a MTP female cable. For distances less than 400 meters, the use of FS MPO/MTP multi-mode fiber cabling is generally the preferred cabling method. The next solution is similar to the previous, but instead of using a 12-fiber jumper directly, the MPO/MTP adapter panel is interconnected. 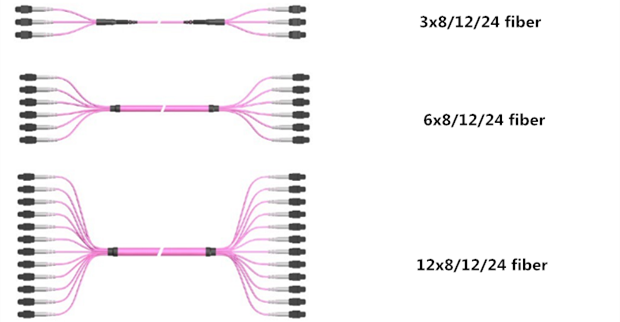 Following picture shows the distribution switch and FS optics and cabling options with corresponding item details for a QSFP+ to QSFP+ multi-mode interconnection. Following picture shows one link with a breakout of the QSFP+ with the use of an MPO/MTP LGX cassette to four 10G SFP+ links. A Type-B female MPO/MTP to Female MPO/MTP assembly is used between the MPO/MTP LGX cassette and 40GbE transceiver. The connections to the SFP+ transceivers is accomplished with OM3/OM4 Uniboot LC duplex fiber patch cables. Sometimes, create a simple, cost-effective migration path by installing a structured cabling system that can support your future 40GbE networking needs. Following picture uses the 8-fiber harness as shown in the diagram to connect to 10G SFP+s. This approach allows for an easy upgrade path moving from 10Gig to 40GbE connectivity. Fiberstore provides wide brand compatible 40G QSFP+ SR4 transceivers and all kinds of MTP cables. Each fiber optic transceiver has been tested to ensure its compatibility and interoperability. Please rest assured to buy. For more information or quotation, please contact us via sales@fs.com. This entry was posted in MPO/MTP solutions, QSFP+ Transceiver and tagged 12-fiber jumper, 40GBASE-SR4 QSFP+, MPO/MTP adapter panel, MTP female cable, MTP Harness Cable, MTP trunk cable, QSFP Transceiver, QSFP+ SR4, Type-B female MPO/MTP to Female MPO/MTP on February 12, 2016 by Alice.Gui.